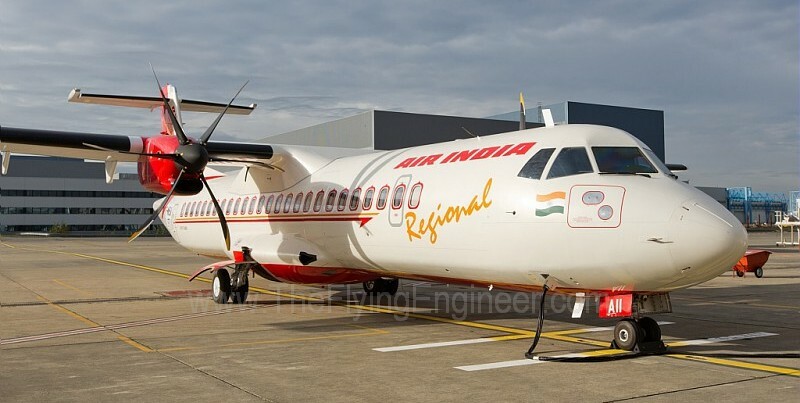 Alliance Air, which is branded as Air India Regional, received its 5th brand new ATR 72-600 from Toulouse. The aircraft, registered VT-AIW, joins the fleet of four other ATR 72-600s, registered VT-AII, VT-AIT, VT-AIU and VT-AIV. Al five aircraft are leased from Singapore based leasing company Avation. The ATR 72-600s, which employ an all new cockpit avionics based on technology used on the Airbus A380, is to replace the aging fleet of four ATR 42-320s. The ATR 42-320s in Alliance air are fitted with 48 seats, while the ATR 72-600s are fitted with 70 seats. The older ATRs sport a four bladed propeller, which made the aircraft noisier than the present six-bladed propellers. Passive noise reduction techniques make the present -600’s cabin a lot more pleasant than the older ATRs’. With the arrival of VT-AIW, which was ferried Toulouse (TLS) – Heraklion (HER) – Ankara (ESB) – Abu Dhabi (AUH) – Delhi (DEL), the total count of active ATR 72s in India (-500 & -600) has gone upto 27, split as 15 ATR 72-500 (Jet AIrways) + 3 ATR 72-600 (Jet AIrways) + 5 ATR 72-600 (Air India Regional / Alliance Air) + 2 ATR 72-500 (Air Pegasus) + 2 ATR 72-500 (TruJet). One ATR 72-500 is undergoing painting at Hosur, destined for Air Pegaus. India totally has 51 70-80 seat turboprops in service, including 14 Bombardier Q400s of SpiceJet. The smaller ATR 42s, aged on average 21+ years, will soon be phased out. Air India Regional / Alliance Air flies the longest turboprop route in the country, between Delhi and Rajkot, over 505 nautical miles, a flight that takes 2:30 hours block time, almost the same block time an Airbus or Boeing mainline narrowbody jet (A320 & 737 family) takes to fly double the distance. Due to insufficient crew, and to align with the schedules of the network of its parent Air India, the ATRs at Alliance Air are not utilised as much as the aircraft can be. Average present utilisation of the aircraft at the airline is close to 6 hours per aircraft per day. The aircraft operate only four flights a day, while Jet Airways operates upto 13 hours per aircraft per day and 9 flights per aircraft per day. (maximum figures). Of the presently four operational ATR 72-600s with Alliance Air, three are based at Delhi, and operate flights to Kullu, Dharamshala, Allahabad, Dehradun, Rajkot and Pantnagar. One is based at Hyderabad, and operates flights to Vijayawada and Tirupati, offering competition to TruJet and Air Costa. An ATR 72 is best suited for short (distance) and thin (low demand) routes of upto 350 nautical miles. Beyond this, a regional jet generally becomes a more viable and economical option. The shortest ATR 72 sector in India is operated by Jet Airways between Porbandar and Diu, a flight that lasts just 45 minutes block time over a distance of 90 nautical miles (166km). The average ATR 72 city pair distance in India is 223 nautical miles (413 km), while the average domestic flight distance across all domestic flights of all carriers on all aircraft in India is 455NM (843 km). 70-80 seat turboprops serve as good feeder aircraft to mainline aircraft, enabling deeper and true regional penetration in India, especially since many airfields and city pairs in India, today, are operationally and commercially unviable for regional and mainline jets. Many runways are too short for regional and mainline jets, and many cities are too underdeveloped to viably support larger aircraft. 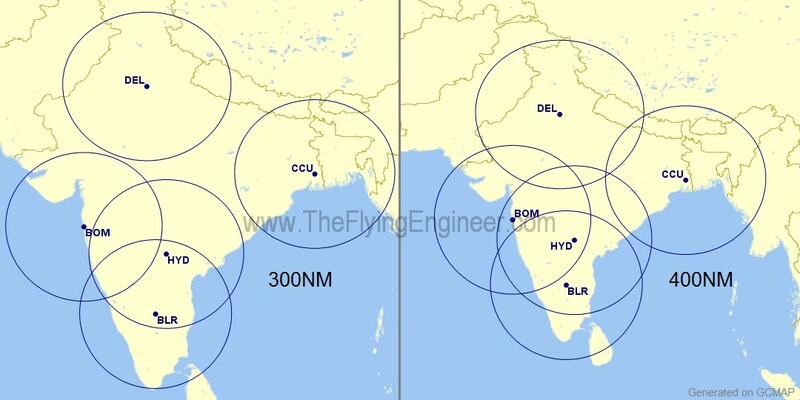 The maps below show the pan-India coverage that turboprops can achieve by being based out of five metros of Delhi, Mumbai, Kolkata, Bengaluru and Hyderabad, and by flying a maximum distance of 400NM. Range circles are 300NM and 400NM radius, as mentioned. Over the next 20 years, a demand for 2,500 turboprops is anticipated, of which close to 50% may be based at Asia. Header image does not represent VT-AIW, but VT-AII.